Many thanks to Butch over at his YouTube channel, butchnews, for taking and sharing video of so many community events around Vancouver. 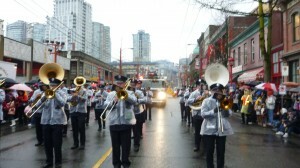 This video is from the Chinese New Year Parade in Vancouver on January 29, 2012. We’ve set the video to start where we come into earshot at about the 2:50 mark, but you can go back to see the very beginning of the parade video, too. Check out the other videos in Butch’s channel to see the rest of the parade. So many great costumes, performers, dragons, firecrackers, and more!